This week, I am tapering (mostly) in preparation for my first half marathon EVER! As many of you know, I will be running the Annapolis Running Classic Half Marathon this Saturday! I have met several of my fellow Annapolis Running Classic A-Team members over the last few months, and I'm looking forward to meeting the rest on Saturday. Judging by the weather reports, the race will be about 20 degrees warmer than last year, and it should be sunny on top of that. Woohoo! If you haven't signed up yet, make sure you hurry up and register! The last day to register is November 18! Be sure to use my discount code (ARREF15) to take an additional 10% off the registration price! Speaking of cold weather, it is that time of year where most of us starting to get a little cracked around the edges. The cool air can really take a toll on your skin, so I know I definitely have to give my skin a little extra TLC to help it survive the fall and winter. I'm always on the lookout for good products that can help me battle the ash, while not causing my skin to react in a negative way. 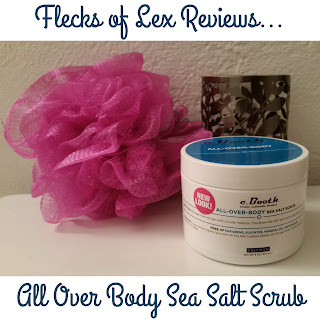 Today, I'm reviewing the All Over Body Sea Salt Scrub by c.Booth. I love scrubs in the winter because I can really scrub that dead skin off, and my skin loves soaking in moisturizers and lotions after I'm all done with a good scrub. I received a coupon for a free c.Booth product from Influenster, which rocks. I checked to see where they sell c.Booth products (I wasn't familiar with the brand name), and saw that they sell it at Ulta. Fortunately, I live within a short walk to an Ulta, so picking out my product on a slow Saturday gave me a good opportunity to get some fresh air and some extra Fitbit steps. I was able to find the c.Booth section pretty quickly, and was impressed by the selection. 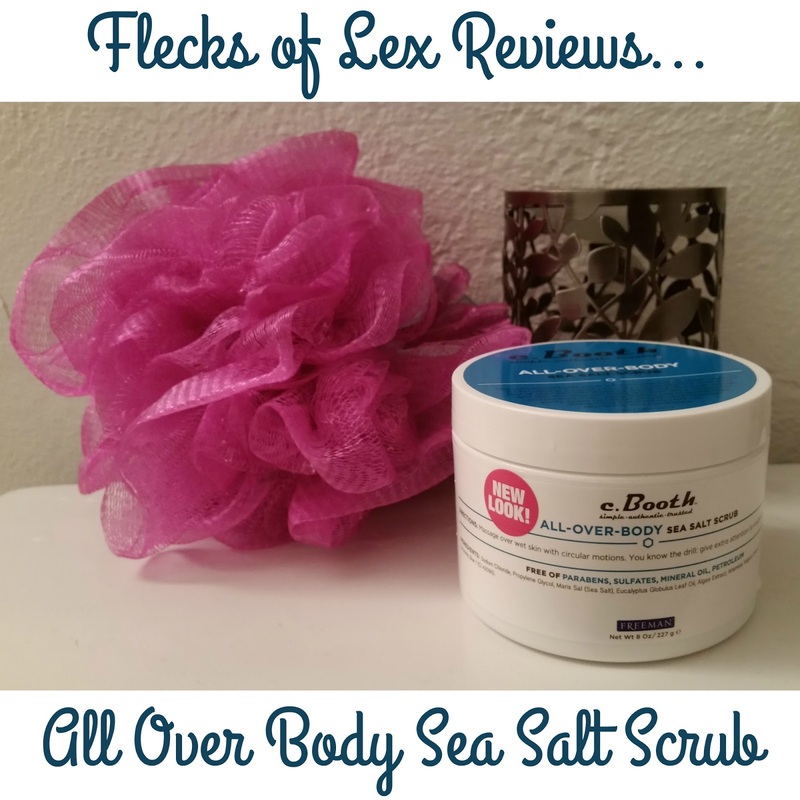 Unfamiliar with the brand, I sniffed a bunch of different products, and ended up settling on the All Over Body Sea Salt Scrub. There were a couple of other fragrances I liked, but I decided not to risk it on my first go around, especially if I wasn't going to like it. My skin is so sensitive that I really can't use a lot of products that have fragrances, so I'm glad they had options that weren't heavily scented. The scrub I selected had a little bit of a medicinal smell, but it didn't bother me. Honestly, I don't particularly like walking around smelling like a fruit basket, which is probably why I didn't care much. I know other people are big on the fruity smells, however, so it's probably best that you give it a whiff before you try it out. Some of their other products had unusual smells, but some of them were very nice. Anyway, I picked up the sea salt scrub, which retails for less than $10 at Ulta, and headed back home. That evening, I tested out the product. While it's not as "scrubby" as I was hoping, it was pretty gentle on my skin. I didn't experience any irritation from the product, which was a major plus. Another positive about the product? It didn't leave a mess in my bathtub! You know how some scrubs cause you to first scrub your skin, then scrub your tub? This one didn't have that problem. It could be that it didn't have as much oil in it as other scrubs I've tried in the past, but I'm not sure. I definitely recommend this scrub, especially if you're looking for an inexpensive scrub that's not going to scrub off ALL of your skin. As I mentioned previously, the smell isn't for everyone, but the product works, and you don't have to use half of a container with just one shower. A little goes a long way, both in the amount of the All Over Body Sea Salt Scrub you should apply, and in the bang for your buck. Disclosure: I received a coupon for a free c.Booth product, in exchange for my honest review of the product. All opinions expressed in this post are my own. This looks good! I bought a scrub from the Body Shop a long time ago but rarely used it because of having to scrub the tub! I'll have to check out this brand. I don't like the excessive fruity or floral scents anymore...it can be a little too much! And yay for Annapolis on Saturday! Totally! After my bad slip in the shower, I have to be extra, EXTRA careful!